Fox News, which has spent the day promoting conspiracy theories about the Bureau of Labor Statistics, is now trumpeting the fact that BLS economists have donated to the Democrats and President Obama to reinforce their theory that BLS data is biased toward Obama. But one of the economists Fox identified is no longer a BLS employee, and only a tiny fraction of BLS workers have even made campaign donations. This morning, BLS released the September jobs report showing that the unemployment rate has dropped to 7.8 percent. It was the first time in nearly four years that the rate has fallen below 8 percent. Media conservatives -- who have a history of attempting to negate positive jobs data -- rushed to discredit the data, claiming the jobs numbers were "total pro-Obama propaganda." During a segment in which he stressed that Fox News had done its "homework," Your World guest host Eric Bolling named two economists he said work for BLS currently "who've both been donors to the Obama campaign," asking, "Should I make any assumptions from that?" 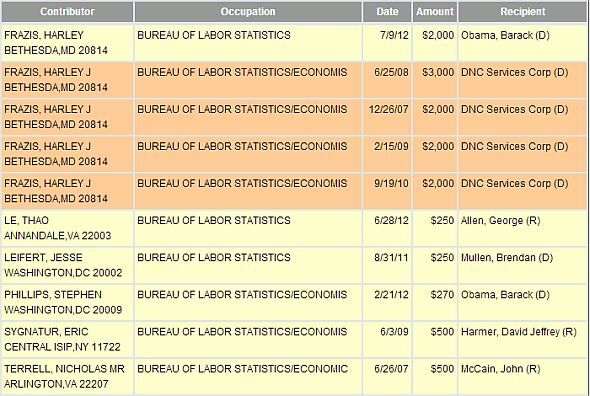 At least two economists at the Bureau of Labor Statistics (BLS) have contributed to President Barack Obama's campaign. Harley Frazis of Bethesda, MD, has contributed at least $2,000 to Obama and $9,000 to the Democratic National Convention over the last three election cycles. Stephen Phillips of Washington, D.C., has contributed at least $270 to Obama during the 2012 cycle. According to his LinkedIn profile, Phillips has been an economist at BLS since June 2009. However, the Free Beacon article was updated to note that Phillips no longer works for BLS: "According to his LinkedIn profile, Phillips served as an economist at BLS between June 2009 and July 2012." Bolling did not correct his contention that Phillips is currently a BLS economist. In fact, as Politico's Dan Berman pointed out, BLS counts more than 2,500 employees and more than the two cited by the Free Beacon and Bolling have donated to political causes.